but that was pretty much it! I dread to think how much makeup was actually still left on my face! I noticed my pores were becoming more and more visible. I suffer with oily/combination skin and have always used face masks for my pores and they seemed to do the trick, but I guess I'm getting older and becoming more conscious about my skin and have started noticing things I really disliked! I was talked into buying Decleors Expression De L'age, which is a roll on serum mainly for lines around the eyes and forehead (lines are a whole other issue that I currently have started to notice!) and with that you got a free gift which had a miniature cleanser, toner, night cream and full size shower gel (I will talk about the Decleors Expression De L'age on another post) after two times using the cleaner and toner I was in love with it! So much so that I rushed out to buy the full size bottles shortly afterwards! The Aroma Cleanse - Essential Cleansing Milk and Aroma Cleanse - Essential Tonifying Lotion are for all skin types, paraben free and contain Neroli Essential Oil which protects and repairs the skin whilst helping to fight dehydration. They do sell cleansers and toners for oily skin, but I have always found that ones for oily skin always tend to leave my skin feeling really tight, which I hate! Apparently you can also use the cleanser to remove eye makeup, which I don't as I don't like creams to remove eye makeup. Now when using both of these you need to damp down a cotton wall pad (or face) and massage the product in to your skin to remove all traces of your makeup. I tend to use a large cotton wall pad for my cleanser and then a small one for my toner, don't ask me why, I just do! Ha! It does a good job at removing makeup, but you do need to really spend time massaging it in, so don't think that you can quickly wipe your face and your makeup will be gone, because it wont! I love how these smell, it's all natural fragrances so they smell gorgeous! My skin feels clean and really refreshed after using them and it definitely helps hydrate my skin, in a non oily kind of way, if that makes sense! My skin has looked so much different after using this, now this could be a combination of me actually removing my make up correctly, using a new serum at night (review on this product to follow soon) a night cream, which I never used to use and also the Expression De L'age, but as a test I decided to try another cleanser and toner to see if this was the case. 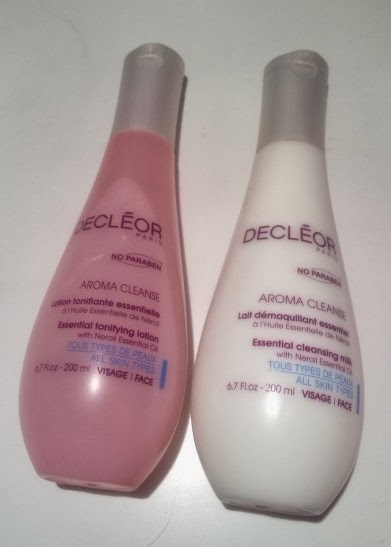 I used a L'oreal cleanser and toner for 2 weeks, and I honestly could see and feel a difference, and not in a good way, my skin was looking rather dull, dehydrated and felt like I had a silicon film left on my face after using them both. I reverted back to Decleor and after a few days my skin was back to feeling and looking great, well better, don't think my skin will ever look amazing! Now these are pricey at £20 each BUT you can find them at a better price around the interweb and also they often do larger bottles for a lot cheaper. With the price being what it is I tend to use them just at night and then throw a wipe over my face in the morning and with that I'm expecting the bottles to last me around 5 months, which if they do last that long I'll definitely be impressed! Overall the price may be a bit steep but the results, well for me, definitely make the price irrelevant. I feel like my skin is being given a facial every single night now, which is a lot cheaper than going for a facial every month or so! Has anyone else used these before? Or have you found a cleanser and toner that are amazing?